On Monday, March 18, representatives from the University of California at Berkeley gave an information session to CIA students and teachers. The institution is well-known and highly respected for its quality of education and for its research in many different fields. UC Berkeley is one of nine campuses situated throughout the huge state which together have a student population of more than 238,000. Several CIA students are currently interested in studying overseas and a few are looking into U.S. options. The session included insights into available programs, prerequisites, language requirements, costs, and living in the San Francisco/ Berkeley area. As the school is highly ranked, admission is competitive, even for international students. Minimum requirements for SAT, TOEFL, and IELTS were given, but the presenter emphasized that with so many applicants, actual scores for these tests among those admitted were significantly higher. Minimum grade point averages were also given, but again, the GPA required for particularly popular programs could be higher. Costs were also a concern among students. California cities have some of the highest costs of living in the country and the Bay Area is no exception. Tuition for programs averages almost $18,000 the U.S. per semester to start with. Add in housing, food, transportation, and other expenses and the price can be daunting. Housing in the area is expensive, but sharing flats with roommates can significantly cut the cost. Having roommates is also a great way to make some friends right away. UC Berkeley offers a wide array of programs to suit a range of interests. For those not interested in attending for a full degree, some summer programs are also offered. 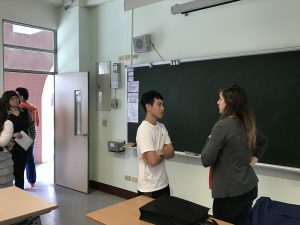 These could be attractive options for those wishing to have a new experience, or for those wanting to improve their English in an immersive setting. All in all, the presentation was a useful exercise for the students. At the very least, it brought the sometimes abstract idea of studying so far from home slightly closer. 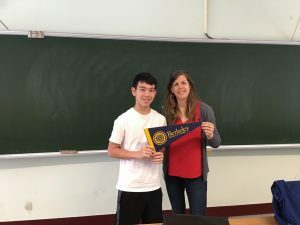 At best, it made clearer the commitment required in undertaking studies abroad, especially if your ideal school is as prestigious as UC Berkeley. A student has specific questions for the UC Berkeley representative.